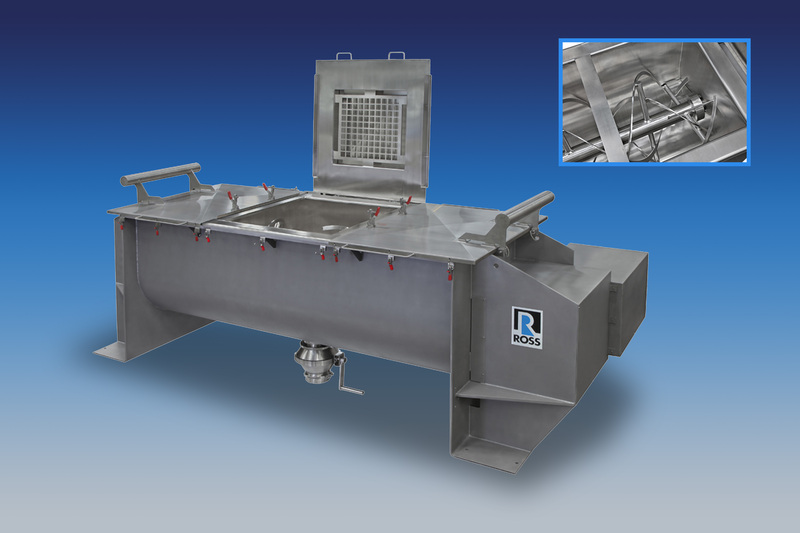 Ross Ribbon Blenders are commonly used for blending dry powders, granules, pellets and other solid forms. They also function as paste mixers, vacuum dryers and granulators. This style of blender mixes product within a U-shaped trough via a horizontal agitator with inner and outer helical ribbons precisely pitched to move materials in a well-balanced axial and radial flow pattern. Tightly controlled clearances between the trough surfaces and agitator tips ensure fast and thorough mixing. An interchangeable paddle agitator can be supplied for gentler blending of shear-sensitive and friable applications. Shown is a 100-cu.ft. Sanitary Ribbon Blender with a three-piece gasket-free cover. A double-acting pneumatic cylinder is supplied for opening and closing the center cover which includes a 30" x 30" hatch with perforated safety grating for ingredient charging. The solid ribbon agitator shaft is designed for center discharge. Scrapers welded to the ribbon ends hold a 1/8” clearance with the trough walls. Product contact parts of this all stainless steel 316 blender are passivated. As is standard on all Ross Ribbon Blenders, this machine is directly driven by an inverter-ready gearmotor. Compared to older belt- and chain-driven designs which suffer from losses in horsepower and efficiency through slippage, direct-drive Ribbon Blenders are more reliable, delivering better performance and requiring less maintenance. Users benefit from electronic speed control, soft-start capabilities and overload protection. Various-size Ribbon Blenders are available from Ross’ robust inventory, ready for fast shipment.